After being released by Oakland recently, defensive end Bruce Irvin has signed a one year deal with Atlanta. Atlanta is trying to bolster their outside pass rush with Takkarist McKinley and Vic Beasley currently not getting the job done. This likely will lead to a rotational role and reduce the IDP value of each player involved even more. 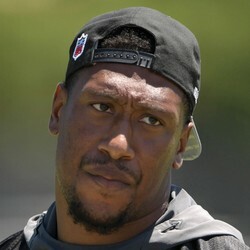 The Raiders have informed veteran defensive end Bruce Irvin that he will be released from the team on Monday. Irvin will head to waivers where he can be claimed by any team willing to pay the approximately $4 million remaining on his contract, otherwise he will become a free agent. In eight games (six starts) this season, Irvin has six tackles and three sacks. Following Thursday’s loss to the 49ers, a game in which Irvin only played nine snaps, coach Jon Gruden said Irvin doesn’t always fit into the Raiders’ defense. “We’re a 4-3 team now, so in the base defense sometimes he doesn’t fit the role we need done,” Gruden said Friday, via Scott Bair of NBC Sports Bay Area. “No disrespect to Bruce, but he’s an edge rusher. Plus, we haven’t had the lead a lot.” He went on to say “I know he’s frustrated. I’m frustrated. He’s a good player.” Irvin should find a new home before season’s end. Bruce Irvin was only able to tally one solo tackle against the Denver Broncos. This is Bruce Irvin's first year for the Oakland Raiders. He was highly touted, coming from the stout Seattle defense, and was paid handsomely for it - signing a four year, $37,000,000 contract. However, those dollar signs are not transferring into statistics so far this year, as he only has 19 solo tackles, two sacks, and four forced fumbles. Irvin will be a player to watch for the second half of this season. Bruce Irvin totaled four tackles, one of which forced a fumble in the Raiders' 17-10 victory over the Tennessee Titans. Bruce Irvin has produced an admirable total of seven tackles, one sack, and two forced fumbles through the first three games of the 2016 season. After voicing his disappointment in his team's defensive ability following the Week 2 loss, the Raiders allowed 395 total yards and 10 points in Week 3. Not phenomenal numbers, but certainly an improvement. The Raiders defense is trending in the right direction.